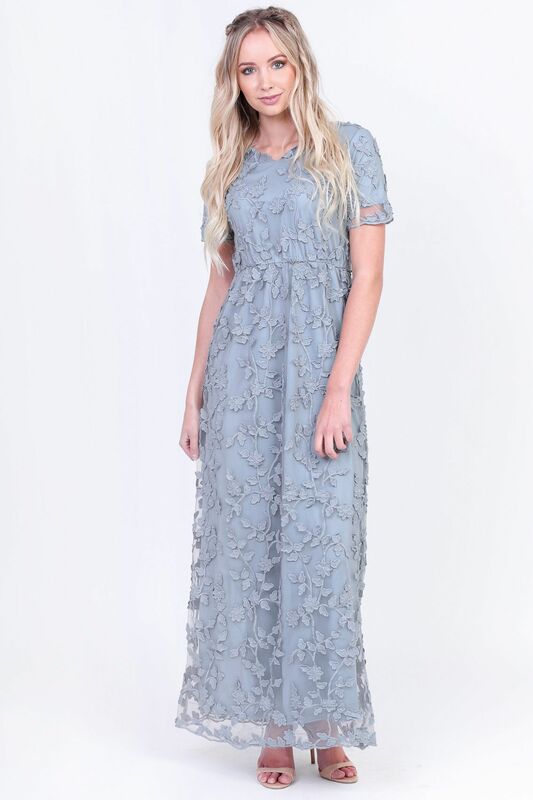 The Kinsley is a gorgeous semi-formal maxi dress! Features include a v-neckline, short sleeves, gathered elastic waist and a long flowing skirt. The entire dress is covered with a pretty floral & vine patterned sheer overlay that's an exact color match to the lining. Pullover style, no zipper. This dress is absolutely perfect for weddings, dances & other special events. It would be a perfect modest bridesmaid dress, Easter dress or Prom dress too! *Please note: the lace on the sleeves ends with the lining; there is NOT a sheer lace extension past the hem of the sleeve. These images were taken with a pre-production sample & will be updated soon! Total Length: XS-S 58.5", M-L 59", XL-XXL 59.5" *This is the length of the dress including the lace. Please note that the lining is a couple of inches shorter than the lace.